Why South Australia had a blackout, and the debate we deserve to have about it. | Good Food. Good Code. Disclaimer: I am not an electrical engineer. My background is in aerospace engineering and applied physics. Which still makes me arguably more qualified to discuss this issue than Barnaby Joyce. On September 28, 2016, a large storm hit South Australia and ended up causing a state-wide blackout. While the fallen power lines pictured below are undisputedly the cause of the blackout, the blackout turned into an argument about the merits of renewable sources of electricity, the rapidness with which they can be adopted, and the robustness of the Australian energy grid. Now that the Australian Energy Market Operator (AEMO) has released a preliminary report into the event, a much clearer picture of what happened is available (which I’ve tried to summarise here). The storm was responsible for tipping over 23 electricity pylons, which took a significant toll on the high voltage infrastructure of South Australia. Due to the distribution of the Australian population, the South Australian electricity network is not built in a grid-like fashion, but rather along a spine as below. Redundancy is built into the spine by having four independent 275kV lines between Adelaide and Port Augusta. Two of these lines are close to each other, running inland past Mt Lock and Belalie. The storm knocked out three of these 275kV power lines. I’ve tried to indicate below the sections of the lines that were taken out. The high voltage “spine” of the network between Port Augusta (Davenport) and Adelaide, marking with red X’s the sections of the 275kV lines that were interrupted by the storm. Note that four wind farms are directly connected to two of the lines that went down and are highlighted in the yellow circle (Electranet, electranet.com.au). All three cut lines failed within less than a minute of each other. The first cut occurred between Brinkworth and Templer’s West, 43 seconds before the blackout. There are no generators along this line, so there was no drop in power production when this particular line was cut. Then, 17 seconds and 8 seconds before the blackout, the Davenport to Belalie line failed twice, and the circuit was unable to reclose. In response to this, 123MW of power production was lost from the state’s grid. A few seconds later, the Davenport to Mt Lock line experienced a failure, which left online one major 275kV line operating between Adelaide and Port Augusta, and took away a further 192MW of power from the grid. It’s worth noting that the same pylons that carry the Davenport-Mt Lock lines also carry the Davenport-Belalie lines, so a failure in both of these lines together is unsurprising. Looking at the schematic of the state’s grid, the disruption to the network surrounding the 6 affected wind farms is clear. Much like AEMO is still investigating the cause of the 300MW of wind power that went offline following the interruption of the power lines, I can’t speculate too much as to the reason why cutting the lines in these three places was so disruptive to power production, beyond pointing out the obvious, that a collection of generators that were in a pseudo-parallel circuit with four rails dropped to being in a very different kind of circuit, and probably didn’t respond to this very quickly. The response of SA’s grid to losing 300MW of power, was to draw more power from the Heywood Interconnector, which joins the state’s power supply to that of Victoria. 3 or so minutes before the blackout, the draw on the interconnector was about 400MW, which rose to around 525MW just before the blackout. This is almost expected, high draw on the interconnector is likely to occur during a storm when wind power tends to be less efficient. What ended up triggering the blackout though was the power draw through the interconnector rising, after SA lost 300MW of capacity. When it rose to 900MW, 150% of the recommended maximum load, the interconnector shut off. Power through the Heywood interconnector prior to the SA blackout (AEMO Black System Preliminary Report). The Heywood Interconnector is able to provide SA with up to 600MW of power. With the interconnector shut off, the effective loss of power to SA was around 800-900 MW, or about half the required load. This caused a rapid change in the frequency of electricity in the system. The typical frequency for electricity in Australia is 50Hz. This can change slightly, but rapid changes in this value can significantly damage equipment. Frequency of electricity measured in various parts of the SA grid (AEMO Black System Preliminary Report). Following the interconnector cut off, the frequency of electricity in the grid dropped sharply, in response to the increased load on the grid relative to production of electricity. To resolve this, Under-Frequency Load Shedding is often used. To normalise the transmission frequency, load on the system is automatically removed so that the electricity distribution can stabilise. However when the frequency is dropping very quickly, this doesn’t work – the frequency is dropping faster than it could be restored by shedding load. For the SA grid, the typical maximum rate of frequency loss is 1Hz/s, and the frequency here was dropping at a rate of 6.25Hz/s. Unable to recover the generation frequency due to the rapid increase in load, the frequency dropped below 47Hz, below the operating frequency of most generators, and so they shut down, resulting in the statewide blackout. With that explanation out of the way, its worth considering the role of different power generation and distribution methods in the light of the blackout. The blackout was clearly not the result of wind power, but rather the result of a substantial loss in local generating capacity caused by freak-ish weather. Rather, it can be seen that the SA distribution grid is not tolerant to large losses in electricity in a very short amount of time. I’m not sure how many power grids worldwide really are. A problem that was highlighted though was how rapidly a 15-20% loss in electricity generation capacity was able to overload a second system – the Heywood Interconnector – and thus bring down the whole network. There is certainly a need for more redundancy in the distribution system here. One failure, albeit a large one, lead to the entire distribution system going offline. Unfortunately, though this has been mentioned in the press, it’s hidden by bellicose rhetoric. It’s simple to call meetings between state and federal governments to harmonise energy policy a stunt, but a better integrated grid is vital to providing energy security (which seems to be the buzz word on the subject). 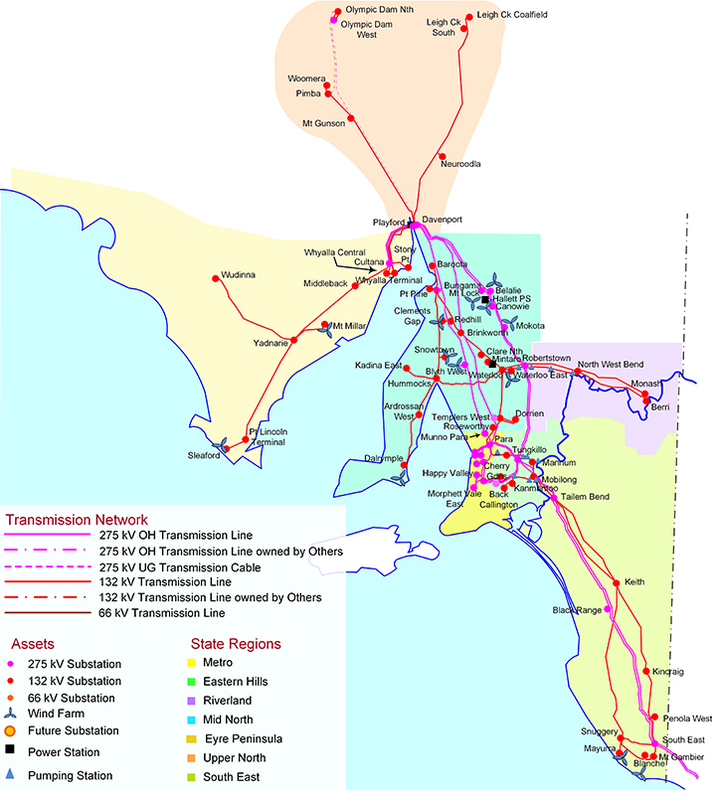 The operator of the NSW grid, TransGrid, is looking in this direction, suggesting the construction of a NSW-SA interconnector, to supplement the two interconnectors from Victoria. Such solutions are far more robust than establishing a better local base load supply from coal, as they further decentralise the production and generation of electricity, providing redundancy without regressing technologically. Wind power does have its downsides. It is variable, and it can lead to fluctuations in the power network. Nor is it as effective at maintaining/restoring a base generation frequency as other systems (fossil fuels, nuclear, hydro). But it is also a very clean, and environmentally safe way to generate electricity that is well suited to SA. Moreover (and awaiting the final word from the AEMO), it was not really responsible for the blackout that occurred a few weeks ago. To claim it is unreliable or fringe technology, or that it doesn’t provide adequately for SA is false, and demeans the integrity of the one making such a claim. The debate we should be having is about improving our national electricity grid, and determining how redundancy can best be introduced into power networks. And rather than fight the inevitable, we need to make sure that a renewable energy future remains part of the discussion. Oh, and we should also be asking why a Deputy Prime Minister can get up and talk about science and engineering as though he’s an authority on the subject without consulting the Chief Scientist’s office first.